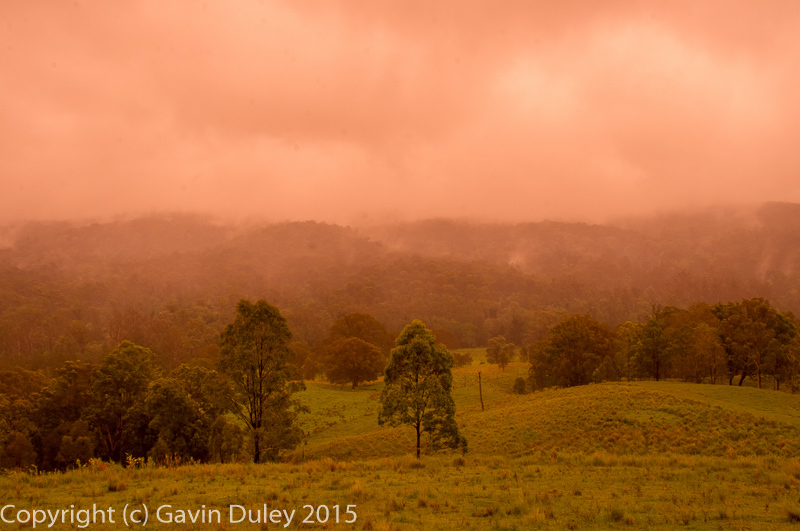 Wallaby Creek, Upper Tooloom, NSW, Australia, 27th December 2015 o3:52. Pentax K-x, 18-125mm lens @ 30mm, 30 sec, f/8.0, ISO 12800. I woke early — it was light out, and I could see clearly across towards forested hills. Early morning fog pooled in the valley, covering the dam, flirting with the hills. The light was diffuse, flat, pearlescent. It seemed as bright as day — a dismal, foggy autumn day, at least. As I watched, the fog gradually eroded away at the hills. I debated internally: was this worth a photo? Could I capture it? Eventually, I gave in. The hills had all but disappeared. And it was not, I found, as bright as day. My first few exposures were pitch black. I had to ignore the light meter: 30 seconds, with the sensor sensitivity at its highest setting, were needed. The landscape seems lost in fog and grain: dreamlike, dreaming. It was an odd day, that. 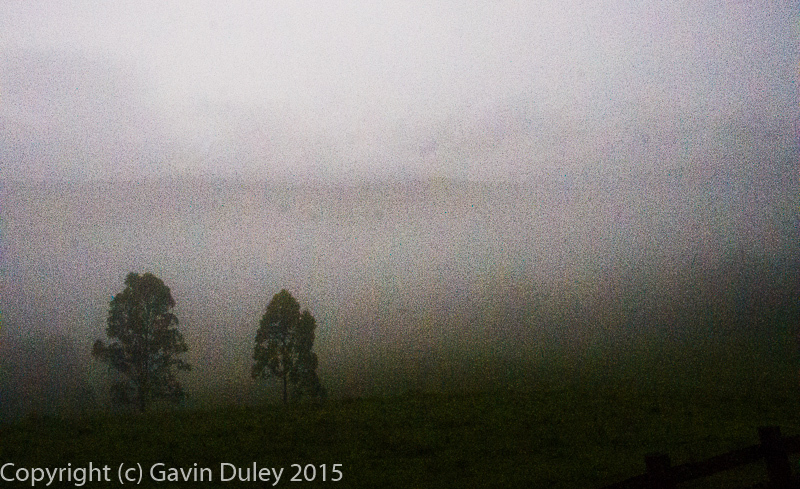 The hills glowered in fog, which came and went, revealing and hiding the vista. By evening, the light went weird: first sepia, then purple, as the day faded into evening. Wallaby Creek, Upper Tooloom, NSW, Australia, 27th December 2015 15:49. 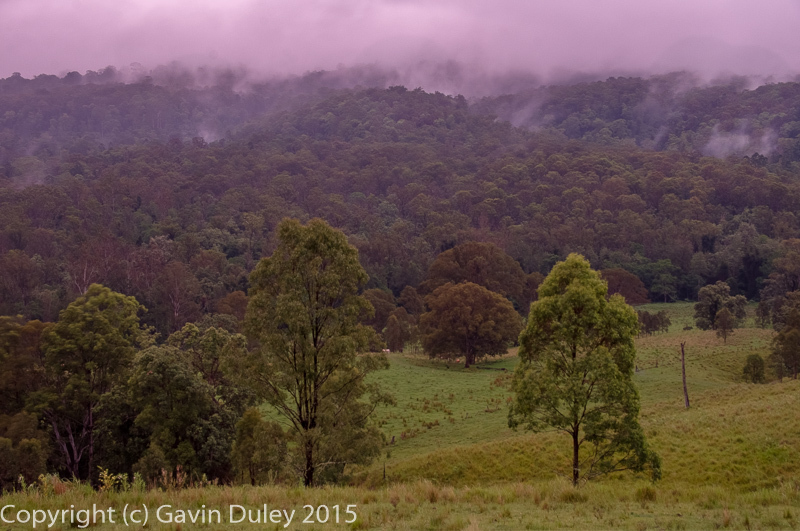 Wallaby Creek, Upper Tooloom, NSW, Australia, 27th December 2015 18:53. 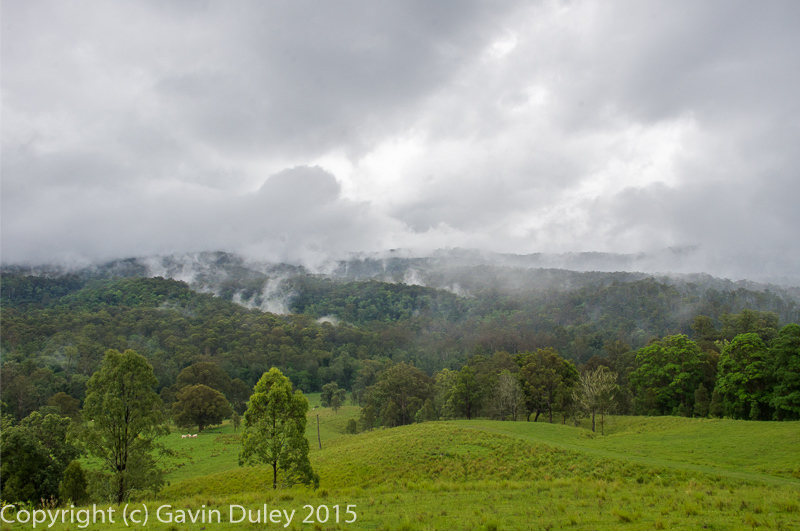 Wallaby Creek, Upper Tooloom, NSW, Australia, 27th December 2015 19:01.